Drinking kombucha has fascinating and positive health properties. Its regular consumption is effective against a variety of benign to severe ailments. But its virtues are still little known today, because few scientific studies have been conducted on kombucha. Some authors see it as a miracle cure that can cure almost all diseases, even cancer. In all cases, the consumption of kombucha is not a substitute for seeking medical advice of your health problems. Combined with a healthy lifestyle, good food choices, kombucha can help you stay healthy. The components of the drink are originally green tea and a starter yeast culture, which helps to strengthen the immune system by regenerating the intestinal flora with its yeasts, bacteria and organic macromolecules. They affect the microbial and chemical balance of the body by improving the overall condition, helping to strengthen and decrease the body’s susceptibility to diseases and pathogens. The micronutrients along with the healthy yeast and bacteria in kombucha help cellular detoxification, purification and sanitation of the blood with their strong antibiotic effect. Consumed daily, this preparation would be effective in preventing certain diseases, cure or alleviate negative symptoms. The drink is credited with fortifying and curative properties, such as: diuretic, purifying, detoxifying, rejuvenating and anti-microbial. The consumption of the kombucha drink would be advised to strengthen natural body defenses, balance the intestinal flora, stimulate digestion, eliminate toxins, improve skin physiology, but also fight against edema, arteriosclerosis and overpressure pressure, gout, rheumatism, intestinal sluggishness, constipation, diarrhea, headache, hemorrhoids, calculations, stress, overwork, asthma, etc. Kombucha has no harmful side effects. The average dose is 1/3 of a liter per day. Some consume up to a liter. For diabetics please seek the advice of a doctor. 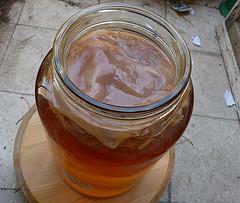 During the preparation of the Kombucha beverage , sugar is transformed into fructose and glucose. Glucose disappears during fermentation and after 12 to 14 hours, only the fructose remains. Fructose is a carbohydrate (the family of monosaccharides), diabetics must always take this into account in their daily diet and watch on the intake of sugars. The first week it is advisable not to drink more than one glass (100 ml. Approximately) per day, in fact, the rapid elimination of toxins through the detoxifying qualities of kombucha could strain the liver. Products containing Kombucha and the kombucha drink itself find many uses for health, beauty, body care and hair health. For example: massages, masks, lotions, shampoos, bath salts…. So, drink Kombucha regularly to keep your intestinal flora healthy and be in an overall top condition and you will likely be quite satisfied with the results on your health and the improved quality of your lifestyle.